"Global Environmental Politics, 4th Edition" by Pamela Chasek, David Leonard Downie et al. 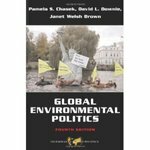 Pamela Chasek, David Downie and Janet Welsh Brown, Global Environmental Politics, 4th Edition. Boulder: Westview Press, 2006. Chasek, Pamela; Downie, David Leonard; and Welsh Brown, Janet, "Global Environmental Politics, 4th Edition" (2006). Politics Faculty Book and Media Gallery. 15.